“The neglect of prayer is a grand hindrance to holiness.” – John Wesley. Martin Luther (10 November 1483 – 18 February 1546) was a German professor of theology, composer, priest, former monk and a seminal figure in the Protestant Reformation. 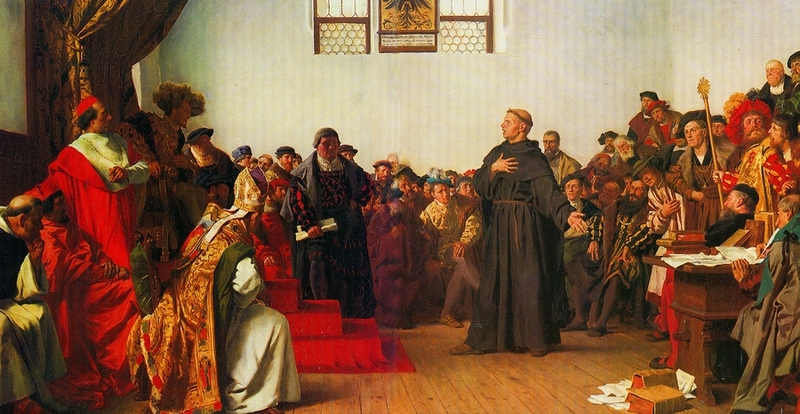 The Diet of Worms 1521 was an imperial diet of the Holy Roman Empire. This one is most memorable for the Edict of Worms , which addressed Martin Luther and the effects of the Protestant Reformation. 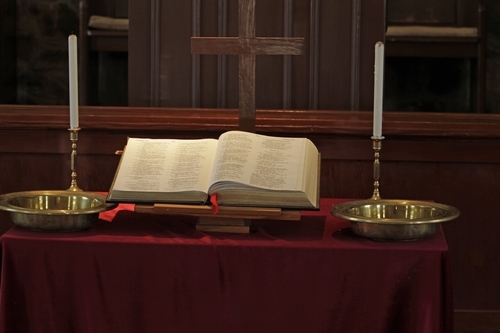 Most Protestant denominations identify two sacraments instituted by Christ; the Eucharist (Holy Communion) and Baptism. This web site provides an introduction to Protestantism, exploring its multi-faceted nature and development. There are between 800 and 1,000 million Protestants worldwide, making up about 30% of all Christians. 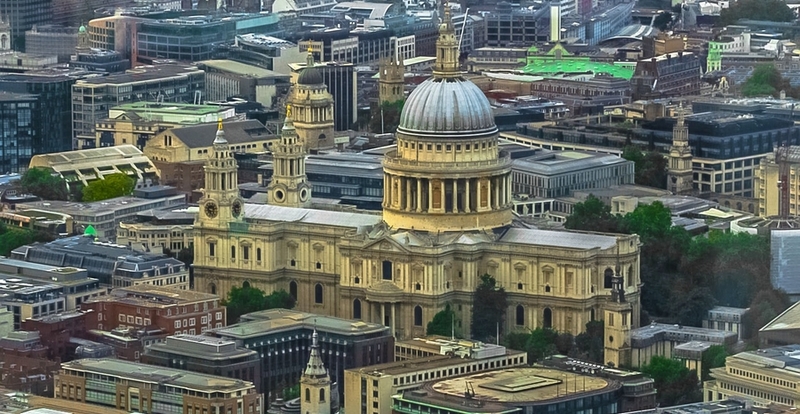 Protestantism continues to shape and influence Christianity in the modern world. Complete a survey for Protestant Christians. View the Protestant population of Europe. 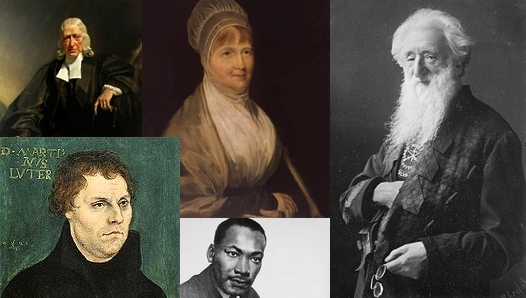 Clockwise from the top: John Wesley, Elizabeth Fry, William Booth, Martin Luther King, Martin Luther. Who is your favourite Protestant? The challenge for all Protestants is to reflect on their shared history within the church founded by Christ himself, who remains its head (Ephesians 4:15-16) and find new ways of relating to the rest of Christendom via ecumenical dialogue. Particularly in the last 30 years or so, the growth of the ecumenical movement has led to new ways by which Christians of all denominations can engage in dialogue and work together in proclaiming the gospel. The word ‘Protestant’ derives from the protests made by German princes at the Second Diet of Speyer in 1529. The Diet voted to end the toleration of those who followed the teachings of Martin Luther within Germany, which had previously been granted at the first Diet in 1526. The core of Protestant teaching lies within the Five Solae (Latin: ‘Alone’), which provide a summary of Protestant theology. 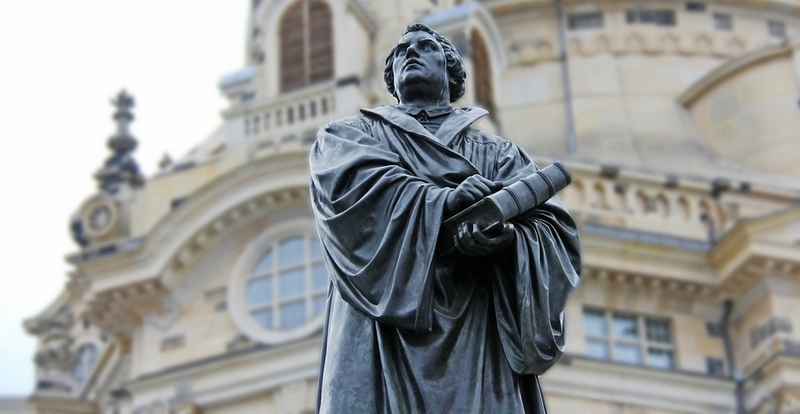 Essentially, Protestantism is characterised by emphasis on the Bible as the sole source of infallible truth and the doctrine of salvation by grace through faith alone (These are known as the formal and material causes of the Reformation respectively). 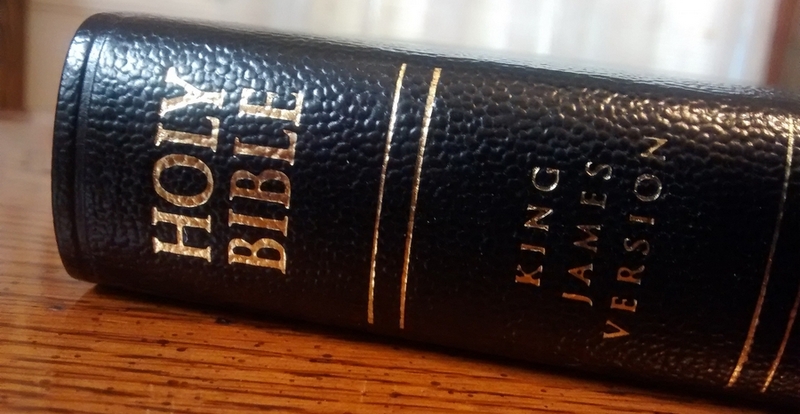 In addition, Protestants have traditionally encouraged private interpretation of the scriptures by individuals rather than relying on the interpretation of the church (as is the case, for example in Roman Catholicism with its Magisterium, or teaching authority). Scripture is said to be perspicuous or clear regarding the essential truths of salvation. As a result of differing interpretations, various denominations have emerged such as Baptists, Lutherans and Methodists, each holding their own distinctive doctrines. NOTE: The term Evangelical (from the Greek evangelion : ‘Good news’) is often used as a synonym for ‘Protestant’. More accurately, it might be described as a movement within Protestantism emphasising evangelistic outreach and commitment to social change. However it can also be used for anyone with an desire to help spread the gospel of Jesus Christ, irrespective of denomination. 1. Figures are taken from the Wikipedia website as of 2015: List of Christian denominations by number of members. 2. Calvary Chapel and Vineyard are non-denominational churches, but are considered to be Protestant in their theology. 3. The Evangelical Church in Germany and the Church of Sweden are both Lutheran denominations, the Assemblies of God is Pentecostal and the Zion Christian Church is an independent African church. 1. Figures are taken from the Pew Forum survey. 2. 11% of all Protestants (equivalent to 5.3% of the total American population) are affiliated with the Southern Baptist Convention. 3. Restorationist churches include the Church of Christ and Disciples of Christ denominations. 4. ‘Other’ includes such denominations as the Holiness and Congregationalist churches. 1. Figures are taken from the US Religious Landscape Survey 2014: Pew Forum. » Additional Statistics on Protestantism in the USA and Latin America. Protestantism as we now know it dates from the 16th century, but the church from which it sprang is of course much older. The Reformers saw themselves as returning to a bibliocentric form of Christianity as distinct from what they perceived as corruption. 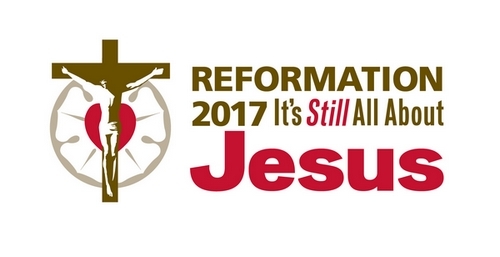 The Reformation was therefore seen as necessary to restore the church to correct doctrine and practice. The Reformation also led to an emphasis on the invisible church, in which all true believers are found across all denominations. This concept, which could possibly be traced back to the 4th century writings of Augustine of Hippo, was developed by John Calvin among others. It stood in contrast to the Roman Catholic church, which insisted on a visible unity, under the headship of the Pope. 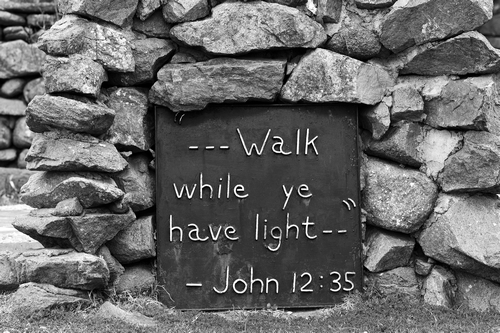 For we have said that Holy Scripture speaks of the church in two ways. Sometimes by the term ‘church’ it means that which is actually in God’s presence, into which no persons are received but those who are children of God by grace of adoption and true members of Christ by sanctification of the Holy Spirit. Then, indeed, the church includes not only the saints presently living on earth, but all the elect from the beginning of the world. Often, however, the name ‘church’ designates the whole multitude of men spread over the earth who profess to worship one God and Christ. By baptism we are initiated into faith in him; by partaking in the Lord’s Supper we attest our unity in true doctrine and love; in the Word of the Lord we have agreement, and for the preaching of the Word the ministry instituted by Christ is preserved. In this church are mingled many hypocrites who have nothing of Christ but the name and outward appearance. There are very many ambitious, greedy, envious persons, evil speakers, and some of quite unclean life…Just as we must believe, therefore, that the former church, invisible to us, is visible to the eyes of God alone, so we are commanded to revere and keep communion with the latter, which is called ‘church’ in respect to men. John Calvin, Institutes of the Christian Religion, Book IV, Chapter I.
Reformation Europe, Late 16th Century. Northern Europe, with the exception of much of Ireland, was to come under Protestant influence. The Reformation in England was initially begun under Henry VIII and then solidified under Elizabeth I. 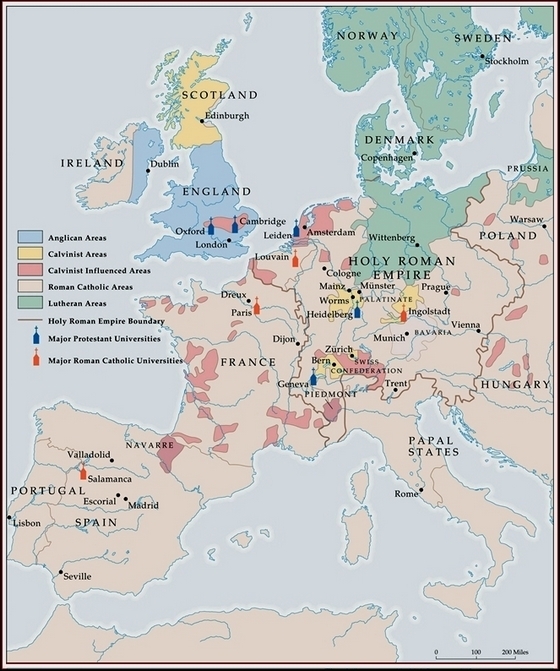 Following the counter-reformation, southern Europe remained mainly Catholic, but Central Europe was eventually to become the site of a fierce conflict known as the Thirty Years War, which took place from 1618-1648 and left much of the continent bitterly divided. Lord, thank you for making us part of the Body of Christ. We praise you for your mercy, your goodness and your unfailing love. Throughout the ages, countless peoples have given testimony of your grace and mercy. We pray that this same grace and mercy may be given to us today. Though your church has faltered, it can never fail because you uphold it. May all of us, no matter what our individual denominational reasonings lead us to believe, serve you with openness of heart, gentleness of spirit and keenness of mind. You prayer was that we may be one: may we strive for that oneness today, recognising our common bond as Brothers and Sisters in Christ. 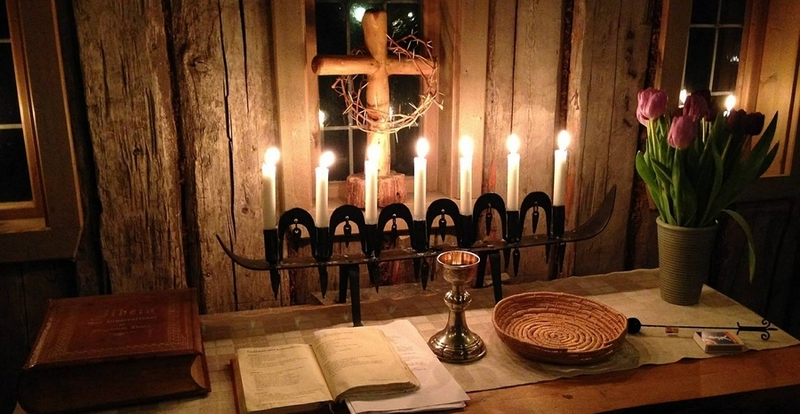 » View details on the Catholic and Orthodox traditions of Christianity. » View a Comparison table between Orthodoxy, Protestantism and Roman Catholicism. » View The Branches of Christianity.